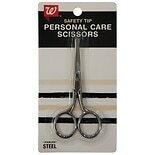 Trim your hair neatly in the comfort of your own home without the cost with a pair of hair scissors. Some help you manage unwanted facial hair, whereas others are designed for clipping tresses. 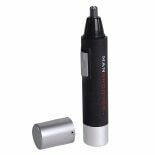 Having a collection of tools for hair cutting ensures that you have the perfect scissors or clippers for maintaining any hairdo. 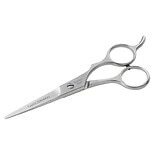 The blades of barber scissors are often sharper than the blades of ordinary household scissors. 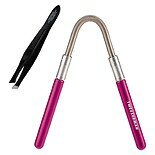 Use them to remove split ends, trim your bangs, add layers and more. Many hair scissors also have a finger rest, which helps you steady your hand and control the action. 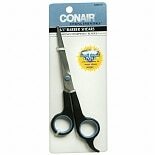 To care for your and your family's hair at home, pair your hair scissors with hair clippers. 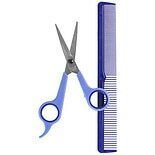 While trimmers provide a uniform cut at your desired length, scissors take care of any remaining stray hairs and are better suited for more complex styles. 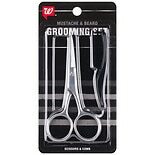 Scissors for facial hair are much smaller than standard scissors. They typically have blades that curve away from the skin, which helps you safely trim hair in sensitive areas. The blades may also have rounded tips. 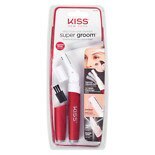 Use them to shape your eyebrows or shorten nose and ear hair. Pair them with shaving and grooming products to keep a beard or mustache perfectly groomed.